Parents, grandparents, and friends packed Our Lady of Fatima Church on Tuesday for the annual Christmas program performed by the students of Our Lady of Fatima Elementary. The program details the story of Jesus’s birth with familiar Christmas carols sung by each class. The 6th grade class provides the background with Joseph and Mary travelling to Bethlehem for the birth of Jesus in the manger. The three wise men also make an appearance to bring their gifts for Jesus. “Each year the entire school comes together to put together this outstanding Christmas program”, said Cindy Hahn Principal. “This is a chance for our students to display their creative talents. This is a show that brings out the Christmas spirit in our students and our audience”. 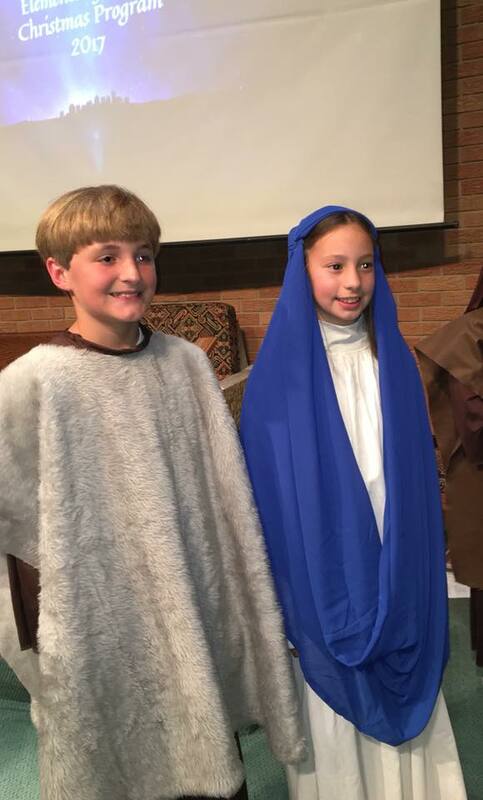 Jake Schaar as Joseph and Taylor Jernigan as Mary in the OLF Christmas program.